India captain Harmanpreet Kaur, who missed the England series with ankle injury, went down two spots to No.9. Smriti Mandhana, the India opener, has broken into the top three of the ICC Women’s T20I Batting Rankings, released on Sunday, 10 March. Mandhana was India’s highest scorer, with 72 runs in three matches, in what was a dismal series for the home team as they suffered a 3-0 sweep at the hands of England in Guwahati. Mandhana took the place of West Indies all-rounder Deandra Dottin, who moved up a spot to second place, displacing Mandhana’s India team-mate Jemimah Rodrigues. Rodrigues totalled just 15 runs in the three-match series and took a tumble to sixth position. New Zealand’s Suzie Bates continued to hold down the top spot, with 765 points, extending the gap between her and second-placed Dottin to 38 points. 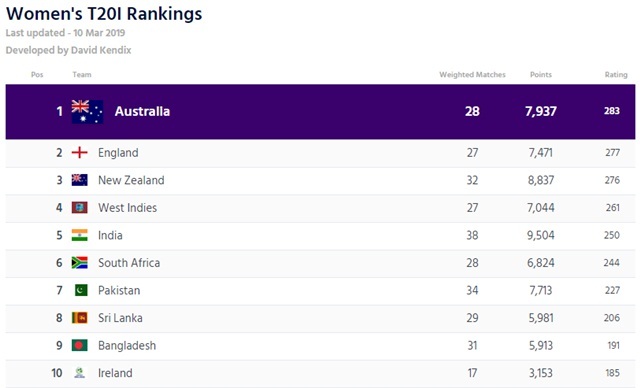 The rest of the top-five remained unchanged, with Australia captain Meg Lanning retaining the fourth position with 695 points, followed by Stafanie Taylor, who trails by a point. 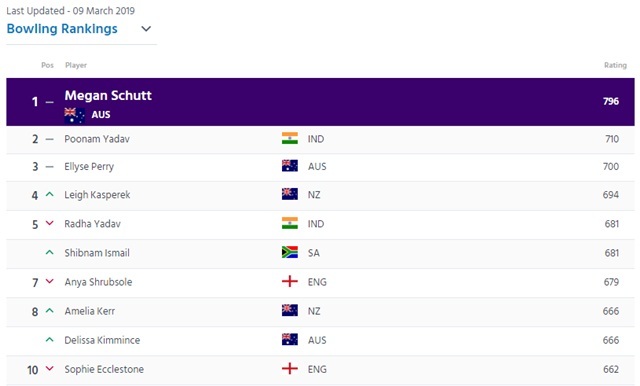 India captain Harmanpreet Kaur, who missed the England series with ankle injury, went down two spots to No.9, allowing New Zealand all-rounder Sophie Devine to climb to No. 7, followed by Australia wicket-keeper Beth Mooney. Mooney’s team-mate Alyssa Healy retained her position to round off the top ten. Meanwhile, England wicket-keeper Sarah Taylor fell six places to No.24, as did team-mate Jenny Gunn, who slipped to No.61. Lauren Winfield, however, moved up eight places to No.45. India’s Deepti Sharma moved up five places to the 71st position. But the biggest mover was England’s Sophia Dunkley, who barged into the top 100 by moving 16 places to 86th position. India’s Pooja Vastrakar went out of the top 100, tumbling 11 places to 103. There were significant changes among the bowlers too. While Megan Schutt and Poonam Yadav the top two positions in the bowlers’ charts, Ellyse Perry, the Australia all-rounder, moved up one spot to No.3, followed by New Zealand’s Leigh Kasperek, who was fourth after jumping two places. The biggest mover, however, was Radha Yadav. She moved up five positions and is now No.5 in the bowlers rankings, level with South Africa’s Shabnim Ismail. However, that meant Anya Shrubsole slid two places to No.7. Her team-mate, Sophie Ecclestone, also took a massive tumble, falling seven places to No.10. Deepti Sharma was another to have a poor time of it against England, and she fell ten places to No.24 after the latest update. However, Katherine Brunt rose 12 places and is now No.35. The all-rounders charts were largely unchanged – Dottin still leads the charts, and Bangladesh’s Salma Khatun rounds off the top ten. However, Hayley Matthews has displaced Natalie Sciver at No.6. Get the latest Cricket News and updates from Women’s Cricket, Match Predictions, Fantasy Cricket Tips and lots more on CricTracker.com.